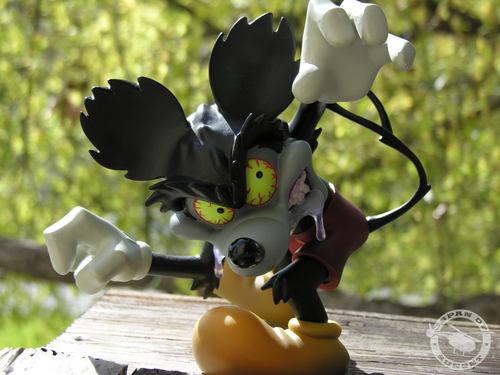 Our recent advance sale of the Span of Sunset, Inc. x Disney Mickey Mouse Runaway Brain figure was an unqualified success thanks to your support. 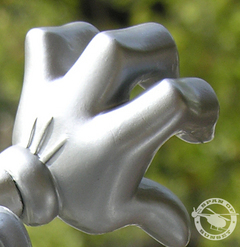 All figures have been shipped out -- the majority shipped Friday (3.16) with a handful shipping today. A lot of you have asked, so if you're looking for Runaway Brain you can head over to Span of Sunset's selection of the four colorways or check with your favorite retailer. Today's the first day to purchase the Span of Sunset Inc. x Disney Mickey Mouse Runaway figure directly from our store, Vinyl Pulse Exclusives. Today also marks our final preview -- here's an exclusive look at the Neon colorway which flips the original colorway on edge with liberal use of neon green spray and did we mention, purple trunks ?!? 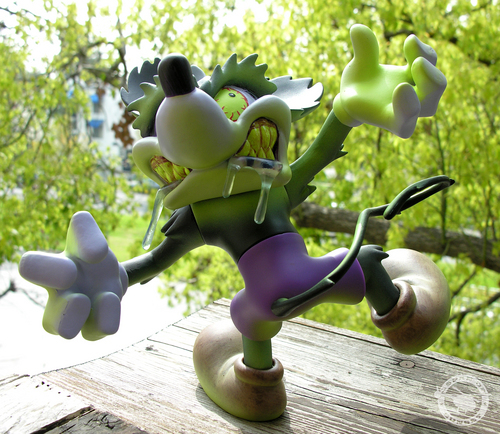 In vibrant Neon the Runaway Brain figure takes on a whole new twisted level. We're proud to announce the advance sale of the Mickey Mouse Runaway Brain figure starting @ Noon Pacific Time today at Vinyl Pulse Exclusives. 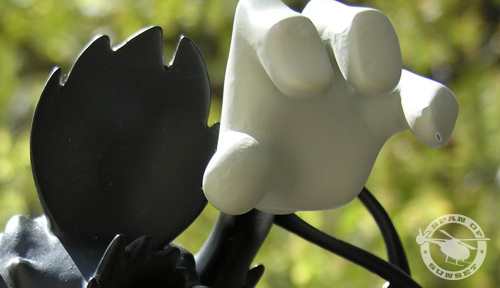 This is your first opportunity to purchase the figure in advance of the official launch. The Original, Chrome, Candy Flake and Neon Editions will be available for 72 hours or until our very limited supply runs dry. Go get 'em. 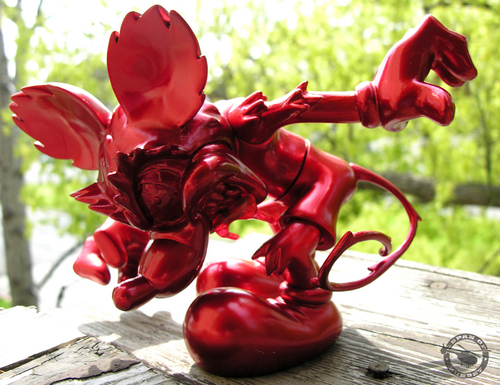 For Day 4 of our exclusive preview of the Span of Sunset Inc. x Disney Mickey Mouse Runaway Brain Figure we're happy to bring you the Candy Flake colorway. 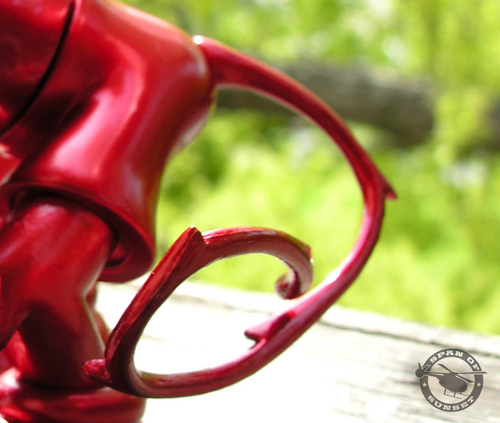 This delicious colorway is quite shiny and has matching red translucent spittle. 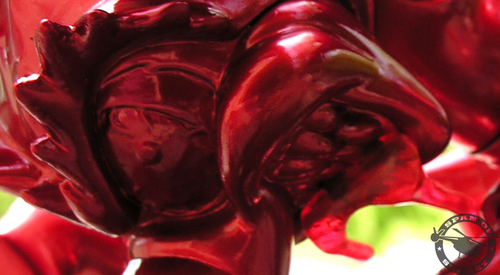 The glossy finish is rather remarkable considering this is not an electroplated figure. As revealed yesterday, the Runaway Brain figure comes in a giant "cereal" box. 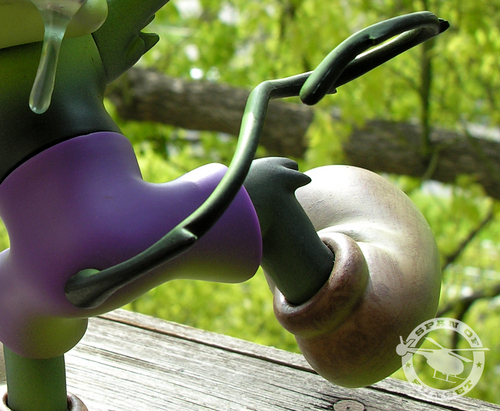 The front cover opens up via a magnetic latch to reveal the figure behind a windowed panel and one of two surprises. Each figure comes with a pack of trading cards. 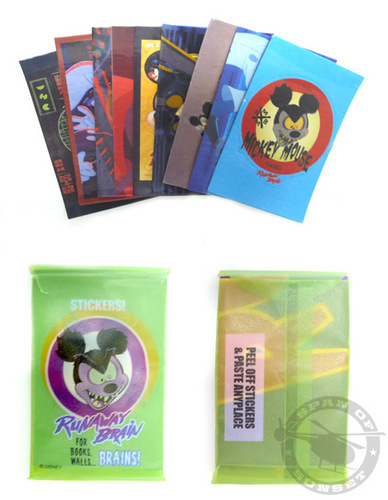 Once the box is open, lifting the insert marked "Look... Underneath Me " reveals an extra sweet premium - a Runaway Brain T-shirt - style and size random. Check back Monday for our final preview and your first opportunity to purchase the Mickey Mouse Runaway Brain figures from the Vinyl Pulse store. Wholesale inquiries should be directed to [email protected]. 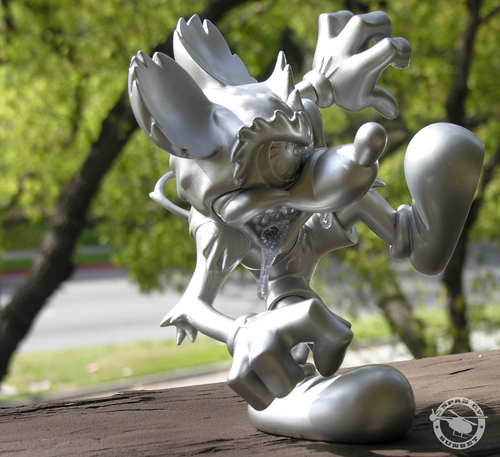 Today we bring you exclusive shots of the Chrome edition of the Span of Sunset Inc. x Disney Mickey Mouse Runaway Brain sculpted by Monster5 . The chrome edition features chrome-specked drool with a finish that sits between matte and glossy. The considerable articulation mentioned yesterday (10 points) is on display here as is the figure's ability to balance in many seemingly unstable positions. At a 7.5" tall from foot to the hand at the highest point, the sight of Runaway Brain balancing on one foot is quite impressive. 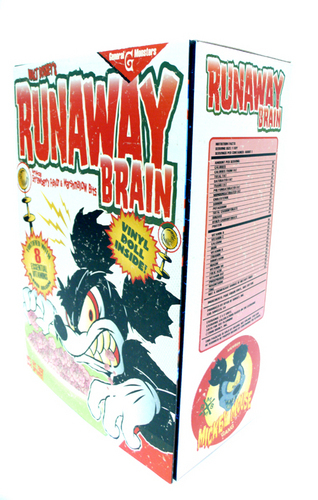 Designed by Nikos Constant and the Disney Hot House design team, the box for Mickey Mouse Runaway Brain was inspired by cereal boxes of the 1960s and 1970s. Runaway Brain rocks the colorful front panel as he devours brains bit by bit on the ridiculously large (6 x 11.5 x 16 inches) box. 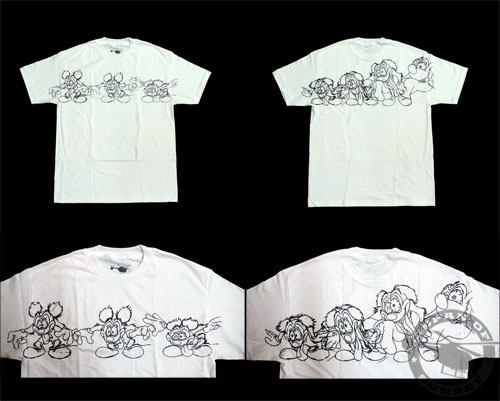 Art from the animated short is sprinkled across the remaining panels. As with all good sugary cereal boxes, this one hides secret surprises. Check back tomorrow as we dive into the big box. Wholesale inquiries should be directed to [email protected]. 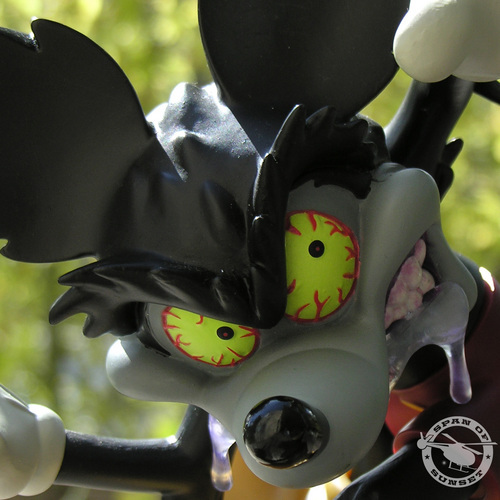 Today we bring you an exclusive look at the original colorway of the Span of Sunset Inc. x Disney Mickey Mouse Runaway Brain figure. 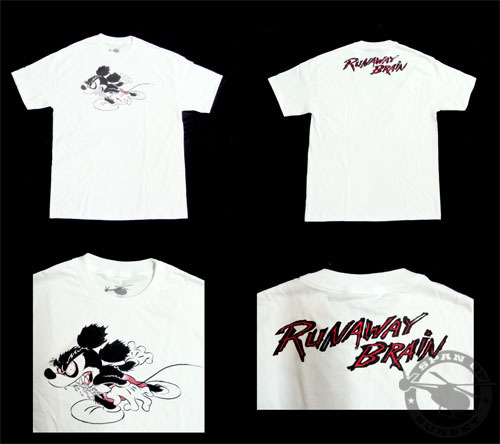 This colorway follows the classic Mickey Mouse colors and is based on the Runaway Brain animated short. 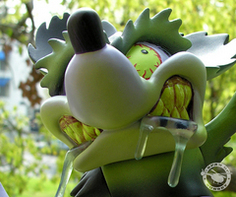 The pictured pose shows off Monster5's detailed sculpt and hints at the numerous dramatic poses made possible by the figure's 10 points of articulation. Wholesale inquires should be directed to [email protected]. 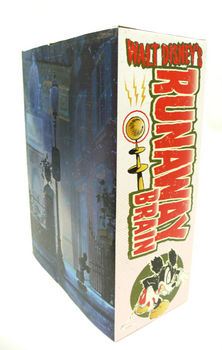 Be sure to check back tomorrow for the latest exclusive scoop on Runaway Brain.